If you are new to grilling, this page on outdoor grill ideas will help you narrow down the best grill for you based on your personal tastes, time, and interests. You will learn about grills, charcoal grilling tips, and a lot about real wood smoke. Like you, I love good barbeque. Yep, men love cooking outside. I suppose it ignites some primitive emotion that dates back to when men sat around grunting and poking sticks into the fire. As my wife would say, men haven't changed much. For us outdoor types, cooking outside creates a feeling you just can't get from standing over a kitchen stove. Now, add the smell of real wood smoke, the sound of sizzle and aroma of meat grilling and you have the makings of a good day. These are the signs of a great weekend, indeed, be it ribs, brisket, sausage, venison, or fish. The barbeque ideas are endless. You should never stop thinking about your own outdoor grill ideas. Good grilling is a learned skill. Bad grilling comes easy. I know. I have a few embarrassing stories about it, but that is for another day. This page is designed to give you an idea of the types of grills out there and what you can expect. You should make a list of your favorite outdoor grill ideas found on this page. Your outdoor ideas list should include whether a gas grill is best for you or a charcoal grill or both. You will figure it out as you go. Happy reading and happy grilling. Your own outdoor grill ideas must start with a grill. I own and use two types of grills, basic charcoal grills and propane gas grills. I have never used an electric grill, but it is an option for some. My largest model is my gas grill, but I also love using my smaller charcoal grill. Both get the job done, but there is quite a difference in how it achieves its purpose and the flavor can vary greatly. Here are a few helpful outdoor grill ideas and tips that may make your selection easier. Or better yet, you can always have both grills available, like me. Maybe my future list of outdoor grill ideas will include an electric grill. There are no flare ups from grease dripping, but with electric grills there is no added cooking flavor other than spices you put on the meat. Ahhh, the good ol' gas grill. Natural gas or Propane. Gas grills are certainly very popular and for good reason. They may be the most popular grills and place high in our outdoor grill ideas charts. Gas grills are often adorned with a lot of bells and whistles. Just standing next to one of these fancy grills, while sporting a designer apron and a pocket full of BBQ tools, is a real ego booster. It can make even the worst cook seem like a master chef. However, the end result has more to do with grilling technique than how fancy your grill is. The good news is that the learning curve is small with gas grills. The Char-Broil Gas Grill pictured is a good basic grill. Nothing very fancy. Light the grill, and by the time your wife pulles out the hamburger patties, seasons them, and brings them to you, your grill is hot and ready to go. On the plus side, propane grills are easy to use, fairly easy to clean, and have no charcoal or lighter fluid to mess with. If you are always pressed for time, this grill is for you. My wife loves it because there is no kitchen mess, except maybe for pre-grilling food preparation. Cooking burgers or hot dogs can be faster than cooking on the stove because the grate's surface area on large grills can accommodate more than your family can eat at one sitting. This is a good point to include on your list of outdoor grill ideas. On the other hand your outdoor grill ideas may lean toward the traditional side. Charcoal grills have been around for a long time, and for good reason. Charcoal is a long-time favorite among those who enjoy traditional BBQ cooked over wood coals. Charcoal grills are generally more basic without a lot of bells and whistles, however, there are exceptions. Charcoal is a wood product and using the charcoal alone will give your meat a little smokey flavor. This is a big selling point and definitely something to add to you outdoor grill ideas. Then add to the hot coals some water-soaked wood chips and you got yourself some fine wood-smoke flavor. Charcoal grills are more work intensive and more time consuming compared to gas grilling, but the flavor difference is enough to sway a lot of people. If you use lighter fluid to start the charcoal, let the coals burn hot for at least twenty minutes before putting meat on the grate. This will allow time to burn off any lighter fluid residue. You want to taste the meat, not the chemical flavor. Now this is where your outdoor grill ideas starts to get exciting. You can really do a lot with charcoal grilling. It all begins with the grill you choose. You may want to add the word "egg" to you list of outdoor grill ideas. There are different models and manufacturers now, but the "Big Green Egg" is a charcoal grill that is somewhat unique in its look and cooking versitility. When you personally examine this grill the first thing you will notice, besides the shape, is that this is no ordinary grill. If you are a petite person, it may take two people just to lift the lid on the largest size grill. Well, maybe not two people. However, you will see these grills are extremely heavy. Their weight comes from the very thick ceramic lining (one inch or more thick) throughout the grill. After lighting the charcoal, the ceramic absorbs the heat and radiates it evenly for cooking and baking much like a brick pizza oven. It definitely abosrbs a lot of heat. Users of the Green Egg claim it uses less charcoal than most grills and can also be used as a smoker, grill, and oven. Because of how it cooks, you can cook fresh pizza as good as any restaurant. Now check this out, a person can actually cook the family's Thanksgiving turkey on this grill. Two large turkeys at once on the largest sized grill. (According to the Green Egg website) Now that's amazing. The one precaution is you don't want to drop it. Being ceramic it is kind of the humpty-dumpty of grills. However, they do come with a good stand. The stand is on wheels, so it is easy to relocate to another part of the porch. You can also purchase a lot of fancy gadgets and accessories, including a large wooden table grill stand. The grill is somewhat expensive, but should last to the next ice age if you take care of it. A large grill is hundreds of dollars, plus the rolling nest. The "nest" is the name of the stand the egg sits in. Cute, huh? 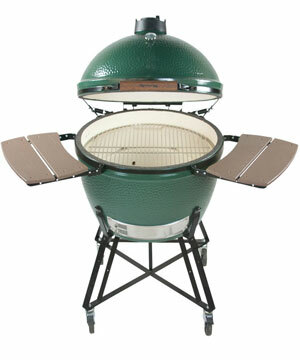 Other manufacturers of egg shaped grills to add to your outdoor grill ideas include the Kamado and Primo Grills. I hear a lot of good things about these grills, especially the Primo grill. I used to live in Texas, north of Dallas. Contrary to what others believe, all outdoor grilling began in Texas... or at least that is what they told me. (Surely Texans don't lie) One great feature of charcoal grilling is the use of smoke to flavor the meat. With side-attached smoke boxes, the smoke flavors the meat, but doesn't actually cook anything. The charcoal does that. The wood passes through a vent into the grill box, circulates around the meat and eventually escapes out a separate chimney. This allows you to maintain the wood separately and control how much smoke enters the grill. Many people like this. Just like restaurants, you can easily control the exact amount of smoke flavor you want. There is a section below on wood flavoring. If you are the resourceful type, you can make your own large charcoal grill from an old 55 gallon drum. I remember growing up that this was popular with my friends. I don't know if it is considered uncool or not now, but it isn't in my book. In these parts, you can get a 55 gallon drum for about 10 dollars. Just make sure the drum originally held cooking oil or something like that. Clean it thoroughly. An automotive steam cleaner is great, if you know your mechanic well enough. Do not use a drum that held harmful chemicals for safety reason. You can make the grill as fancy as you like with only a few inexpensive parts and a welder. Smoke boxes, chimneys, you name it. In one or two days you can be cooking on your own handmade grill. Some of the smaller charcoal grills are much more portable than gas grills. You can easily take them with you on picnics, camping trips, to the lake, or just about anywhere that you plan to BBQ. Legs easily detach or fold up on some models for easy transport and cleaning. As a side note, you may have noticed that many parks and campgrounds have permanently installed grills that use charcoal as the heat source. Of course, I would only use one of those grills as a last resort. Many people have no respect for things not their own and I have seen some of the garbage left on them. If you decide to use a park grill, clean it thoroughly before use and remove all previous ashes before grilling. 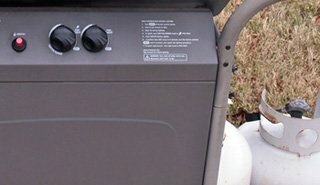 Gas grills use propane (or natural gas) that can last for a considerable time, even months. Of course this depends on what you are cooking and the cooking times. Many gas grills pretty fancy, even some less expensive ones. Stainless steel all around is quite popular. 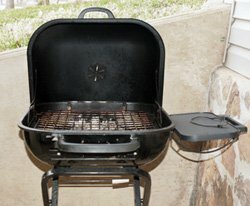 Gas grills have consistent heat that is easily adjustable with the turn of a knob. Gas grills have a lot of accessories, such as gas flame side burners. You can make your homemade bbq or grilling sauce right at the grill. Using wood chips with gas grills are best used with a built-in smoker box since gas grills are not built to accommidate ashes well. However, without a smoker box you can still use wood chips with some easily made homemade devices. If on a tight schedule, cooking times are more predictable with a gas grill than with charcoal. Gas grills heat up in only a few minutes and cleaning can be as easy as turning the grill on high to burn off residue followed by brushing the grate. You can be one with "Hank Hill" and his famous line, "Smell the meat, not the heat". Charcoal grills are very simple and can be very inexpensive (compared to some gas grills) as well as being more portable. There is no heavy propane bottle to lug around. Grills size range from quite small to enoumous. You can cook a mastadon on some large charcoal grills. Charcoal grilling is what many people think of when barbequing. It is an age-old, time proven method. The art of cooking over a wood flame and glowing coals. The smell of charcoal burning brings back memories of my childhood. A variety of wood smoke flavor can be instantly added by placing water-soaked wood chips (actually wood chunks) directly onto the coals. You do not need a smoke box unless it is what you desire. 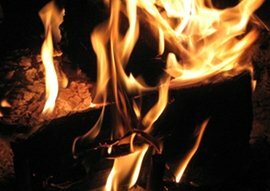 Wood heat can be adjusted in any number of ways by careful placement of coals or by moving the coals around later. This will be explained below in greater detail. You can use ligher fluid to start the fire or use a charcoal chimney to light the charcoal without the use of any lighter fluid. Make sure you compare the advantages of each grill to your personal desires and record them on your outdoor grill ideas list. 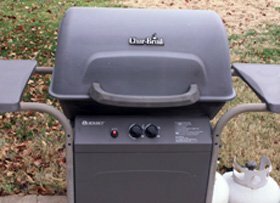 When Buying a Grill, Do You Get What You Pay For? When making a list of your outdoor grill ideas, you have to ask yourself if you really get what you pay for? Is an economy barbeque grill a good investment? Are they as good as the more expensive grills? Well, that depends on your point of view. Men have been cooking over fire long before modern grills ever appeared. Fire is fire. However, depending on your needs and desires, modern gas grills can be very basic to extravagant. It is a lot like a new car. All cars will get you to where you want to go, but some provide a more comfortable ride there. True, some grill features are just eye-candy, but those features can sell grills. Prices for new grills range from under one hundred dollars to thousands of dollars. Manufacturers like Weber®, Char-Broil®, Brinkmann®, Perfect Flame®, and others make a wide range of affordable grills. Looking under the hood, most grills have a single primary cooking grate with a secondary warming rack. I personally have had grills from different manufacturers. They all lasted several years and did a good job, but some just aged more gracefully than others. Black metal on the economy grills tend fade quickly in the sun, but the meat still tastes the same. The part that always wore out the fastest was the burners and the heat distribution shield that covers the burners. Personally, a lot of grills look the same to me, except for the name. A few stand out. Weber® is a very popular brand that makes some heavy duty, high quality gas and charcoal grills that will last for many years. They rank at the top of our outdoor grill ideas list of quality grills. Go to the store and try a side by side comparison. Just by lifting the hood you can actually feel the difference in the weight and construction compared to other grills. Forget the tinny feel, these are built to last. The price of quality grills will be much higher as well. This is something to note on your outdoor grill ideas list. For example, Weber® is double or triple the price of similar sized economy brands, such as Char-Broil®. 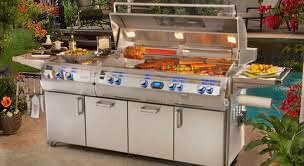 The high end Weber® grills can run $2000.00 to $5000.00, but most are in the $400.00 to $1000.00 range. Char-Broil is in the $100.00 to $400.00 range. However, I want to note that Char-Broil® brand, as well as most of the other manufacturers, make a good grill for those on a tighter budget. If you have the need and the money, or if you simply have an ego the size of Texas, you can always purchase the most expensive production grill on the market: The R. H. Peterson Fire Magic Diamond Series Echelon E1060S Gas Grill priced at over $13000.00. It is probably safe to leave this one off your outdoor grill ideas list. Besides, your wife probably has this one on her "Over my Dead Body" list. This is the Cadillac of grills that uses infrared and propane gas and can double as a second kitchen. However, I don't think it has a small refrigerator, something they should add. It is certainly big enough for one. R. H. Peterson also makes a super-duper charcoal grill for those who prefer grilling with charcoal fuel. This is probably the hardest part of using a charcoal grill. Getting the heat just right takes practice, but it is not too hard. Adjusting the heat on charcoal grills is actually more flexible than with gas and propane grills since you decide where the heat will be and in how many places. A definite point to add to your outdoor grill ideas. If you prefer one side of the grill to be very hot. This is where you produce high heat on just one side so the heat radiates to the other side. Why? By placing the meat on the cooler side you can slow cook without burning. This is also good when you have various foods on the grill that cooks at different temperatures. Here is how to set the coals: remove the coals from the bag and simply pile the charcoal up in several layers (three or four high or more) with the base of the coals being wide enough to cover about one quarter to one half of the grill bottom depending on the size of the grill. It is best to lay out the bottom layer of coals for the base. Lightly coat each layer with fluid before adding a new layer. If using a charcoal chimney, after the coals are red hot, you will need to pile the coals carefully as you pour them from the chimney. Use elbow length insulated grill gloves to handle the chimney since it will be super hot. Piled coals will generate more heat over a smaller surface area. For slow cooking, place the meat on a section of grate with no coals, but still fairly close to the coals. You will have to turn the meat often because the side closest to the heat will cook faster than the opposite side. For dual side indirect grilling, you will need to make two piles of coals, one on each side of the grill bottom. In the middle of the grill, leave at least a third open with enough room to place an aluminum drip pan. You can make a drip pan out of heavy aluminum foil to the size you need if you choose. The pan will help prevent flare ups and keep the grill bottom clean. Place the meat in the center of the grill over the drip pan. This is a popular method of cooking steaks, ribs, chicken, brisket and other thick cuts of meat. It allows for a longer cooking time without burning. For even heating throughout, follow these instructions. Pile up the coals and light them or use a charcoal chimney. After the coals are hot and thoroughly heated, spread out the coals evenly over the bottom of the grill. You may need to lower the grate closer to the coals since the heat will not be as intense. This is great for cooking hamburgers, chicken wings, hot dogs, fish, pizza, etc. When cooking burgers, you may want to keep a quarter of the bottom open and free of coals in case you need to move the meat to a cool section. Place the meat over the coals and be prepared for flare ups from dripping fat. A spray bottle containing water will keep flare up under control. Additional Tips: Always brush on barbeque sauce when the meat is almost done. This prevents the sauce from burning before the meat has finished cooking. For long cooking times, be prepared to add more charcoal as coals start to cool down and dissintegrate. You can use the chimney starter to start the additional charcoal or simply put the unlighted charcoal directly on the old coals. There needs to be enough heat left in the old coals to light the new coals. It is not recommended you use lighter fluid at this point since you can easily contaminate the meat that is cooking. This is where the fun begins and separates the beginner from the seasoned pro. Smokey flavor can enhance the meat or overpower it. Choose the best wood for you meat choice. You can purchase your own wood chips or you can collect you own. Remember, various woods will give you food a different smoke flavoring and intensity. The smoke of some types of wood can be very strong, others are tart, while others are produce sweet and mild smoke flavor. What you use depends on the meat choice and what you like. Important Note: If collecting your own wood, do not use wood from diseased trees. Here is a good rule of thumb: Wood producing the heaviest smokey flavor (i.e. Mesquite, black walnut) should be reserved for meat requiring short cooking times or wait until the meat is almost finished cooking before placing the wood on the coals . This is the same for wood producing a tart smoke flavor, unless of course you really prefer that. Do not use wood with heavy sap, such pine wood. I must admit that I am not sure about peach tree wood. It is quite sappy, so I have avoided its use so far. Before using wood chips or wood chunks, it should be totally submurged and thoroughly soaked in water or beer for at least an hour before placing them on the coals. Remove the wood from the water and immediately place them on the coals using tongs. Soaking them in water keeps the wood from catching fire, while producing more smoke. It doesn't take a lot of wood to produce a sufficient amount of smoke. 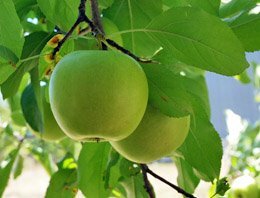 Fruit trees in general produce a mild smoke flavor that many people prefer. Fruit tree wood produces a sweet smoke and can be used with long cooking times. Briskets, ham, and ribs taste great with fruit tree wood smoke. such as brisket, fruit wood is often preferred. The wood smoke will not over power the meat. Apple wood (like apple tree in photo) is very popular and produces a very mellow wood smoke flavor. Apple is not necessarily recommended when grilling chicken, however, because the smoke tends to tint the skin in an unappealing dark color. Cherry Wood is also a popular choice for a mild smoke flavor. It is considered a universal grilling wood that can be used on fish, pork, chicken, lamb, and beef. Note: Fruit tree wood is more forgiving than other woods. If is hard to overpower the meat and the flavor is more mellow. Mild and sweet smoke flavor can be expected for other fruit woods as well, including pear, orange, and apricot. Hickory and oak wood gives a strong smokey flavor, with oak being the least intense of the two. Oak can be used with most meats. Black walnut, trees that are abundant here in Missouri, produces a very strong and heavy smoke flavor. Be careful using black walnut unless you really enjoy an intense smoke flavor. Mesquite, well-known in barbeque circles, produces a very strong smoke. In fact, it is one of the most intense. Mesquite wood also burns very hot and is not recommended for meat requiring long cooking times. Using very little mesquite wood will produce a whole lot of smoke flavor. Nut trees are favorite choices with speciality smoke shops. The wood of many nut trees produce mild to moderate smoke with a nutty flavor that is great for fish and pork. In the southern and Midwest states, pecan wood is easily obtained. If you are looking for free, high quality wood for your BBQ, check out areas recently hit by hurricanes or at home construction sites. I remember one pecan plantation in Texas had lost three quarters of their trees in one hurricane. I know the loss is painful to the tree's owners, but in similar situations, if you explain what you need the wood for, the owner may be willing to give you as much as you need. Be sensitive and respectful and you may be very surprised. You can find a number of exotic smoke woods this way.